When the tiring day ends, what can relieve our back pain and uncomfy limbs more than a fluffy body pillow? A body pillow can really make our nights and days comfortable, most especially if you are expecting. A soft yet supportive body pillow can provide the ultimate relaxation whenever you need it. There are hundreds of body pillows out there, and the search for a better, if not the best choice can be rather challenging. Hence, we gathered a list of the bestselling body pillows, and we found one of the top choices among consumers: the AllerEase 100% Cotton Allergy Protection Body Pillow. 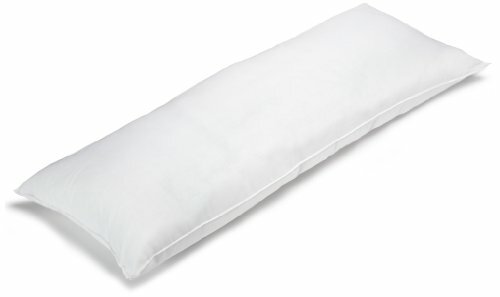 100% cotton cover: With a pure cotton cover, this body pillow is soft to touch and comfortable against the skin. Pillow covers made with synthetic fibers can trigger skin sensitivities and even asthma due to chemicals used to produce the materials. The cotton cover also makes it easy to clean and also keeps it breathable, allowing you to feel cool and fresh all night. Fiberfill: The 100% polyester fiberfill may be synthetic, but it won’t trigger allergies. Plus, it provides the fluffiness you love while providing the support you need. It also keeps the pillow durable and long-lasting. 230-thread count: Most pillows have covers made with 200 or even 150-thread count cotton. Although that is also considered as pure cotton material, the quality of the fabric is compromised since the thread count is low. Many experts say that the higher the thread count, the better, and this body pillow uses a cotton cover with 230-thread count, making it superior compared to others. Comprehensive allergen protection: Pillows can be full of allergens; hence, you are always waking up with a stuffy and itchy nose. AllerEase Body Pillow keeps allergens out, thanks to its allergen-barring material that offers utmost protection from microscopic organisms, pollen, dust, pet dander, and other types of household allergens. 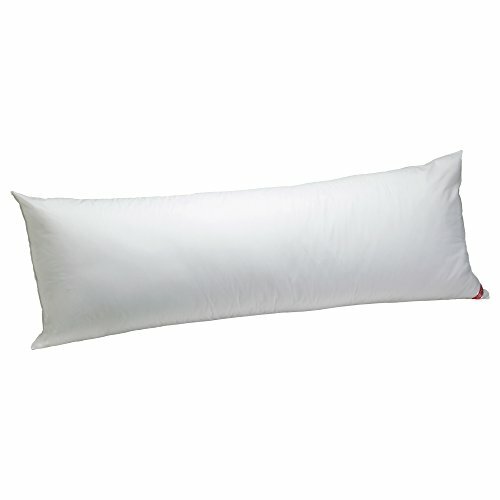 Using this pillow is not only comfortable, but it will also keep you from having allergy attacks like asthma and hives. Provides comfort and support: This body pillow measures 20” x 54” and is long enough to support your whole body, especially your tired abdomen, hips, back, and neck. It provides the comfort and support needed by expectant mothers and is also great for the elderly, children, and generally everyone who loves a comfy good night’s sleep. Waterproof: The cotton cover is resistant to light splashes of water, so you do not have to worry about accidental spills on your new favorite body pillow. Machine washable: Pop the AllerEase Body Pillow into the washing machine and wash in warm water and a mild detergent. Tumble dry low, and it will be is as fresh as new. Good Housekeeping Seal of Approval: The seal guarantees customer satisfaction, or you can report a defective product to Good Housekeeping, and they’ll guide you on how to file a complaint to the manufacturer. We like that the pillow cover is made with 100% cotton, making it breathable and soft to touch. Also, the polyester fiberfill is hypoallergenic, offering complete protection to any form of allergens. It is also firm enough to keep sensitive body parts such as the neck and the back supported while the fluffiness provides you with a perfect relaxation and cuddling buddy. Another plus point is that it is waterproof and can repel bits of water splashes, in cases of accidental spillage. We also love that it is machine-washable, so no fuss in cleaning and keeping it fresh. According to the package, this pillow comes in at a size of 20” x 54”. However, actual measurements may be a few inches smaller than advertised. Also, the pillow does not come with a pillowcase. While the AllerEase 100% Cotton Allergy Protection Body Pillow has almost all the qualities we are looking for in a pillow of a similar size, there are other brands available that might work better for you. The BioPEDIC Premium SofLOFT Body Pillow is a good product to compare the AllerEase 100% Cotton Allergy Protection Body Pillow with because both are advertised as 20” x 54” pillows. They are also both filled with hypoallergenic polyester fiber, and you can feel the softness of the two. However, AllerEase Body Pillow is better in terms of support because it has a little firmness into it. For us, a pillow that is too soft that it cannot support the body is not comfortable to sleep or rest on during the day. You can even feel your knees bumping into each other when side-lying when using the BioPedic pillow. Also, since BioPedic seems to have lesser and looser fiber fillings, machine washing it usually makes it lose its shape. The AllerEase 100% Cotton Allergy Protection Body Pillow may not be as fancy as the memory foam pillow used in hotels, but it is thick, fluffy, and provides both comfort and support. People who have difficulties in finding a comfortable sleeping position will definitely benefit from it. It is ideal for pregnant women, elderlies, young children, and also those who have chronic back or neck pains. What sets this body pillow apart is its ability to repel allergens that can trigger reactions. This is possible with the pillow’s fiberfill that has complete allergen protection. It is breathable, thanks to its 100% cotton cover and is also machine washable for easy maintenance. You also don’t have to worry that it will be out of shape after washing and drying; the fiber filling retains its shape and fluffiness. While the AllerEase pillow does not come with a pillowcase, it can easily fit in any standard body pillowcases available. This body pillow also comes with a warranty. Therefore, overall, the AllerEase 100% Cotton Allergy Protection Body Pillow is worth the purchase.